Silver prices on the New York Commodity Exchange (COMEX) have fallen 72.6% from a peak of $51.38 in April 2011. That makes the current slump one of the worst crashes in silver price history. 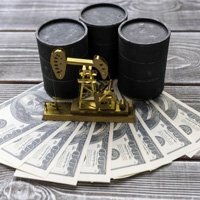 Futures for March delivery currently trade at a seven-year low of $14.10 per 5,000 troy ounces – the amount traded on each futures contract. 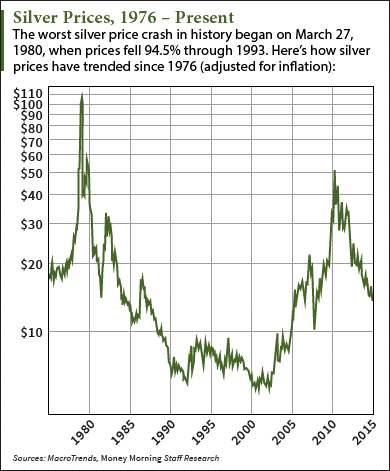 Although the current crash has been brutal, it pales in comparison to the silver price crash of the early 1980s. On March 27, 1980, the price of silver collapsed 63.6% in one day. That was the largest one-day drop in history. The event is now known as "Silver Thursday" and was caused by two brothers – Nelson Bunker Hunt and William Herbert Hunt – who tried to corner the silver market by buying up futures contracts and physical silver. The brothers used loaned money to buy their positions and ended up defaulting on their loan margins. That caused a long-term bear market for the precious metal in which prices tumbled 94.5% to below $5 through February 1993. While investors may be worried about the current silver bear market, they need to keep the drop in perspective. After all, it's far from the biggest decline we've ever seen. According to Krauth, silver's use in renewable energy technology will continue to grow and increase demand in 2016. You see, silver is an essential component in the photovoltaic (PV) cells of solar panels. As sunlight hits the silicon cells in silver, it generates electrons and forms an electric current. Silver's conductivity also enhances the sunlight's reflection in order to improve the energy that's collected. About two-thirds of an ounce of silver are used in each solar panel. That means silver prices will be first in line to benefit from global solar demand, which is expected to grow by about 12% this year, according to market research firm IHS Inc. (NYSE: IHS). Consumer demand for bullion coins will also help lift silver prices in 2016. According to the U.S. Mint, sales of 1 oz. American Silver Eagle coins hit a record 47 million in 2015, up from about 44 million in 2014. The Mint already reported sales of 4.95 million 2016 edition coins during the second week of this month alone. "Bullish sentiment for physical silver has been strong and growing, as witnessed by coin and bar sales," Krauth said. "Thanks to all these factors, I believe we could see silver approach the $18 level, which would bring it above its current 200-day moving average and set the stage for further gains." The Bottom Line: Despite being in one of the worst bear markets in silver price history, silver's losing streak is about to end. As prices near a bottom, silver demand will increase thanks to its use as a solar energy component and collectible coin item. That will send silver prices on a long-term rebound in 2016 and beyond.